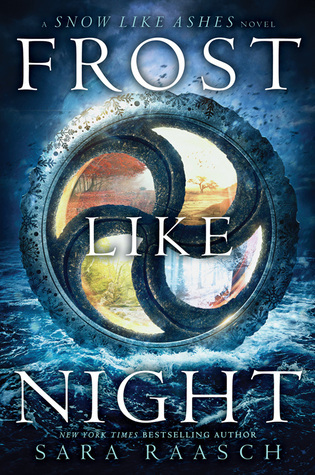 After a slightly disappointing Ice Like Fire, Frost Like Night gets things back on track and takes everything to a satisfying conclusion. This was a solid finale and I can honestly say I am pretty happy with how the story was ended. I feel like Frost Like Night took the fantasy book checklist and crossed so many things off: we have the heroine going through training by a mysterious but wise mentor, all characters coming together, secrets coming out, plans being made, some time for romance, epic quests, tragic losses and the final life-changing showdown. It all felt a bit generic, but it worked. What didn’t work for me was the magic system. Though this is probably just because I had trouble getting through and staying focused on book 2. This is where a lot of the magic was explained and since I ended up skimming a lot, I got confused really quickly. This confusion only got worse in book 3, but I ended up just going with the magic flow. That’s how it works? Okay. They’re doing things that way because of that magic rule? Okay. That’s how we defeat the bad guy? Okay. I don’t get any of it, but whatever, it’s all okay. And honestly, it worked for me. I got to enjoy the rest of the story without worrying about the intricate rules of the magic system. So other than that, this was a good ending. I liked both Meira and Mather’s character development. I loved the romance, even though I didn’t like some of the choices made in book 2. I loved that we got more Cerridwen, but I also feel like ultimately it wasn’t really necessary either. I like that she was there, but I don’t feel like she added a lot to the plot. So overall, I’m happy that I finished this series and I am relieved that it ended on a high note. Unfortunately it still felt a bit too generic and confusing to go down as one of my all-time favorites, but nevertheless it’s still a good read if you’re a YA fantasy fan. Have you read Frost Like Night? What did you think about it? Ice Like Fire was so disappointing, I felt like I drowned in my own tears. (even though I can swim muahaha) When I read Snow like Ashes (a day before reading Ice like Fire) I thought it was phenomenal and would be my fave series of all time.. the next day, my feelings changed drastically for this series. I just wasn’t excited to read the finale anymore.. I am glad though you liked it but I am not sure whether I would be still reading it… Now I think this is just another series that got ruined by the sequels.